PRP, Mesotherapy and Microneedling- what’s the fuss all about? I’m a little lazy with skincare and if its invasive…. Well, you can assume that its going to be hard to pin me down. We have however, recently introduced a new machine to the practice, our wonderful meso gun U225. Our therapists needed practice and we needed guinea pigs ie my face, neck and tummy. What is the difference between mesotherapy, microneedling and PRP? Why did I invest in this particular gun? Deanna, my therapist, cleansed my skin; and started using the loaded gun on my face- without topical anaesthetic or painkillers! Today is Boxing Day and time for me to review this procedure which was done in August; so 4 months later. In all honesty, I have forgotten that I had this procedure done and stumbled upon this whilst getting ready to write a hormone blog post. I’ve just had the busiest few months of my life. Working almost everyday including weekends and most evenings as well after putting my children to bed. I haven’t had the luxury of time to do any facials or any procedures; despite simply having to go to a different room within my practice. My skincare routine is still fairly basic. I’m diligent about cleaning my face in the evenings and about applying a range of facial products that I rate highly. I dream of having a radio-frequency skin tightening treatment - a treatment that brings about so many benefits that if I only had an hour, that would be my treatment of choice. All I can say is that it finally makes sense. I couldn’t really understand why my skin looked this good; or at least way better than I had expected. I’m used to it playing up the moment stress mounted. This is completely normal for most people. I don’t normally use foundation or concealer and this hasn’t changed. What everyone sees is literally my own skin; besides lipstick and a bit of eye makeup. On the last day of work, I also had the pleasure of bumping into an old client of mine that we did 2 rounds of PRP on freehand. I must say I was amazed at how different his skin looked. He had very bad pitted acne scarring with a highly uneven texture. That had now smoothed over quite a fair bit. There is still some ways to go but he really hasn’t done much else eg peels, microneedling radiofrequency and more sessions of PRP. But he was really happy with the improvements. Final words? I’m sold. Maybe now, instead of radiofrequency, I will add PRP for overall rejuvenation including for hair regrowth- a huge area within the PRP world. This fits in extremely well with the ethos of our clinic and my personal believe - a better, more rested version of you. Nothing artificial about it! Actual result achieved at the harpal clinic with Intraceuticals after one 60 minute treatment. + What is 'The Three Step Hyaluronic Layering' system? This is the first step in your skin’s visible transformation. Cooling, calming, pressurised oxygen increases absorption of the Rejuvenate serum and naturally improves your skin’s moisture levels while Vitamins and antioxidants protect and defend. A combination of lightweight Hyaluronic Acid, Vitamins A, C, E and Green Tea result in instantly smoother looking skin with reduced appearance of fine lines and wrinkles, better volume and increased firmness. Your skin will emerge deeply hydrated, balanced and glowing with vitality. Results are not only instant but continue to improve in the following days, in conjunction with continued use of at home products. + What are the celebrities and professionals saying about Intraceuticals? Naomi Campbell - Supermodel "Thank you Intraceuticals. When constantly travelling I get dehydrated and Intraceuticals is an absolute necessity to replenish my skin". Victoria Beckham "There is nothing like Intraceuticals...it really helps you look and feel your best". Eva Longoria - Actress “The treatments are a necessity before every major event”. Katy Perry - Artist "I use Intraceuticals oxygen skin treatment to hydrate my skin and give me that fresh, well slept glowing look before any performance or appearance". Miranda Kerr - Victoria Secrets Model "Intraceuticals facials leave my skin glowing and radiant! Thank you". Fergie - Artist & Actress "Thank you Intraceuticals. When I'm on the road it's important to take care of my skin". Steven Klein - Creative Photographic Artist www.stevenkleinstudios.com “The Intraceuticals treatment helps capture the very essence of the most beautiful subjects”. Michelle Peck - Hollywood Skin Specialist “In just one 30 minute treatment, skin looks and feels rejuvenated, radiant, moisturized and fresh”. Jenny Shircore- Academy Award Winning Makeup Artist "Makeup artist Gina Brooke introduced me to Intraceuticals treatment in which I could visibly see immediate results. Using intraceuticals on movie sets will prep skin beautifully before any makeup application." Katherine Jenkins - Welsh Soprano "After a long haul flight from the UK to New York last year, my make-up artist introduced me to the Intraceuticals treatment. My skin looked dehydrated and tired but after a 30 minute treatment with Gina Brooke, I looked like I had had a weeks rest and I was amazed by the results. Everyone complimented me on my glowing skin and the results lasted. I would highly recommend this to anyone in a heart beat, I love the fact that this is a non invasive natural, easy to use and very pleasant way to look my best." Kristy Hinze - Australian Model, Actress and Television Host "I just received a beautiful gift from Intraceuticals, I just wanted to thank you very much, I love the facials that Meg gives me, it really does help my skin stay vibrant during the long hours of filming on a TV set. The box that it arrived in is absolutely gorgeous too. Thank you very much." Rachel Zoe - Fashion Stylist to the Stars "Travelling and keeping my hectic schedule can be exhausting, but an Intraceuticals treatment keeps my skin looking well rested and glowing. I can't live without it!" Preity Zinta - Bollywood Actress "I always want to look my best on the red carpet. 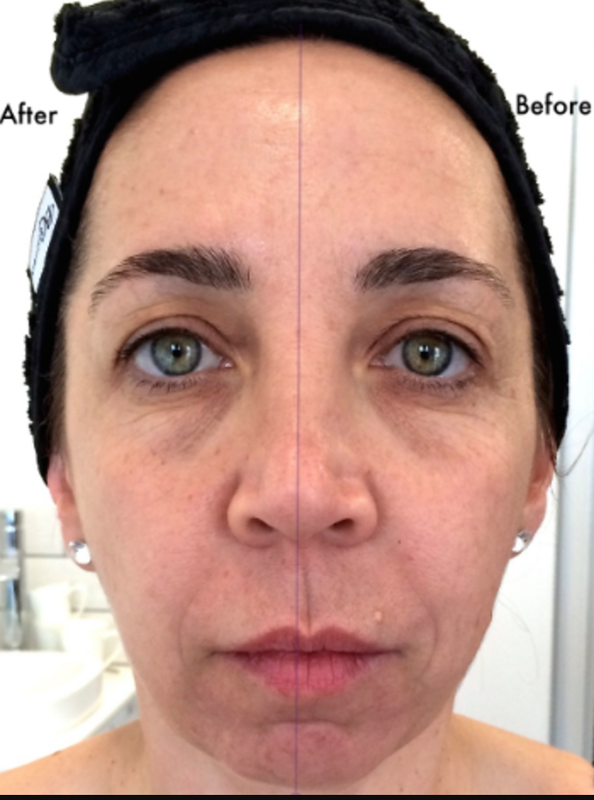 Intraceuticals treatmentss are the perfect way to make my skin glow." Crina Matei - Romanian Actress "Not just a necessity but a joy and a treat for my skin. All these in just one word: Intraceuticals." The final step in the hyaluronic layering process. This moisture rich product contains multi-weight Hyaluronic Acid providing intense hydration and a blend of essential oils – jojoba, macadamia, wheatgerm, sweet almond – to lock in hydration. Vitamins A, C, E and Green Tea protect and help defend against environmental stress and the visible signs of premature ageing. This Hyaluronic Layering process offers unmatched hydration and long lasting results. Continued use of Treatment Support Products is an essential stage in prolonging the benefits. Apply twice daily and prepare to be impressed. If your significant other is helping himself to your moisturiser with annoying regularity, its time to get him educated. Send a link of this piece so he can read it - its for his own good. Men are getting into skincare in a big way, and thats why there is a sudden fluctuation of tremendously fresh, glowing men bouncing around the City. This could be for various reasons, maybe its the amount of advertising being bombarded on them recently, maybe it's the rise of the 'selfie' or maybe they're just born with it. Who knows? What 's true is that while some men are confident enough to buy their own products, others are more than happy just to use their partners. You may be wondering, why not? Well, women's products are designed for women - and spoiler alert guys, your skin is not the same as a girl. First of all, men have more testosterone so this contributes towards oilier skin which has some positives. The plus sides of oily skin is the ageing skin manifests longer than it does in women, the off side is that they'll be more prone to acne and during adolus and hormonal surge we'll see acne resulting in pitted scaring. We see quiet a lot of men with pitted scarring at our clinic than women. Also note, their skin is thicker, they have hair growth on the skin which causes excessive irritation and damage. They can get folliculitis from poor shaving habits similar to when women shave the bikini line. Although something is better than nothing, your complexion needs its own formula. But, we understand that you'd rather be watching the FA Cup Final, so we've got you covered. Ideal for: everyone, especially those who shave a lot, spotty, large pores, dull skin. (30 min or 60 min) a hard working treatment to unclog every single pore, the therapist will even show you how much gunk she extracts from your face! Ideal for: just before a big event, this is the full works and suitable for all skin types. (45min) with luxury in mind this facial hydrates, plumps and leaves you glowing for up to a week. Best just before an important event. Our facials are as bespoke as a suit from Saville Row, we understand that your skin can change from time-to-time and so, we have created mini-enhancements to add to your facial for maximum results. Check our facial page for more info on enhancements. This lightly exfoliating wash helps enhance exfoliation and prepares the skin for treatment. The key ingredient is Polyhydroxy acid to enhance exfoliation and remove debris from pores. This uber simple wash doesn't dry the face and is suitable for all skin types. Keep this next to your shaving kit. Healgel products have been designed by British plastic surgeons for wound healing, so it's perfect post shave. Soothes, repairs and protects the skin and can help with a wide range of skin care concerns including scars and eczema so feel free to use it on the body too. Good for: lazy days, slap it on all over the face and you're good to goPacked with naturally derived minerals and omega oils to help "rescue" skin from the daily rough and tumble. 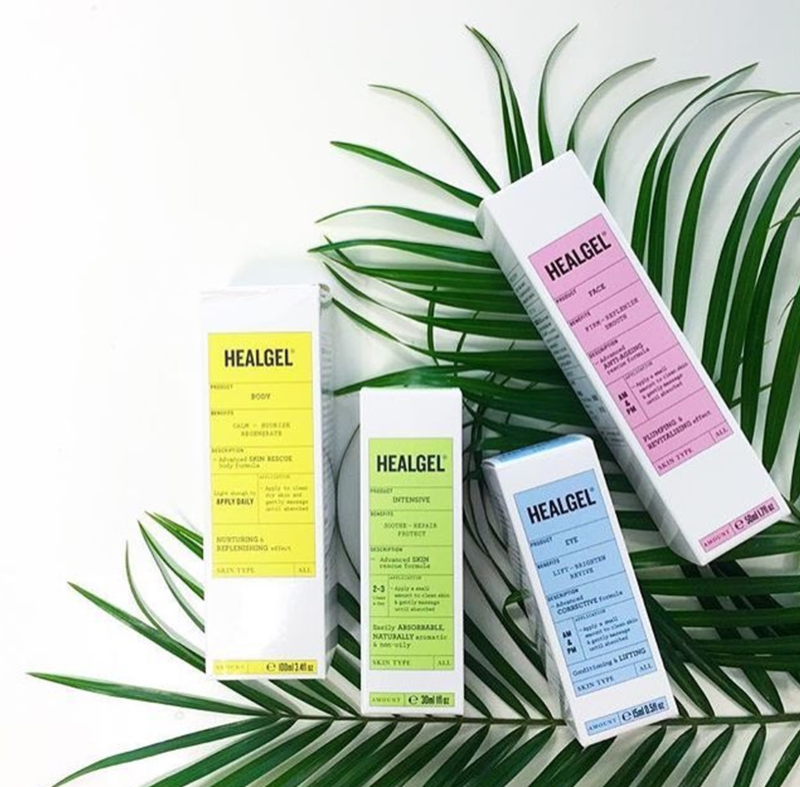 Don't mistake this with Healgel Intensive, whereas the green one targets specific problem areas, the pink one is a lightweight formula for all-over-use. Whether you're working too hard or partying too hard, the results can often show around your eyes. This gel-like formula cools, lifts, brightens and hydrates the skin around the eyes for that instant "awake look".